“Whoever latches onto the ideas in JOBS, How the United States Can Reach Long-Term Full Employment should be the next president of the United States. Both the Republican and Democratic Party fully understand that the hot topic in the election will be jobs. My book, JOBS, details my 10 building blocks that show how the United States can reach long-term full employment, ending the huge job losses we experience with every economic downturn. The beauty of these 10 building blocks is that these solutions do not require any help from the government other than what is in the pipeline already. I describe how every American worker can benefit from my ideas backed by my peer reviewed research study, and learn to transition into the knowledge worker economy. I call this a sort of revolution because the American people need to be jolted into thinking in terms of life-long learning and training to keep up with changes and advancements in science, technology, medicine and new things we have never heard of, or thought about. Our workforce needs to be ready for these new types of employment and forget about relying on low skilled, low pay, jobs that we need to let go overseas. Our society is evolving at break-neck speed, and so are the types of jobs we will have, and so is the need for preparation of the American people to meet this challenge. Wisdom in the Streets and my current book represent projects that are new and unique. Wisdom has never been done, a book like mine has not been written. This book solves unemployment in the perfect world, ie: If everyone followed the strategies and new theories I present, ups and downs of unemployment would be significantly reduced and we would achieve long-term full employment. Wisdom leverages specific volunteer talent to improve businesses such that new jobs are created and ready and willing job seekers are there to fill the jobs, both complete with a volunteer mentor who advises each regarding how to succeed. Briefly, Wisdom in the Streets helps businesses to improve operations such that they can create NEW jobs and Wisdom has job seekers ready for those positions. Wisdom will be made up of volunteers who advise the businesses and integrate the new employees into that business. This mentor follows the business and the new employee so that they are both successful. The mentor can be someone in that neighborhood who has a business background or he or she can work with the businesses and the new employee by phone, e-mail and so on. Wisdom selects “Advocate Volunteers” who are from the neighborhood who are neighborhood leaders or people who care about the neighborhood. Advocates help oversee which businesses need help and track qualified job seekers to keep a ready list of job seekers to fill these new jobs. Dr. T. William Hefferan, DBA, MBA, CCIM, CPM. How do you describe a person who is a scholar, author, entrepreneur, adventurer, seaman, triathlete and author? Dr. T. William Hefferan has done 12 Alaskan expeditions, descended to the floor of the Grand Canyon and summated in the dark of night back up to the South Rim — 9 degrees F — in just over 15 hours (an apparent world record) and has done everything imaginable on the sea, from sailing the east coast to hydroplane racing. Designer/developer of commercial investment real estate projects as President/CEO of a 100 employee company. 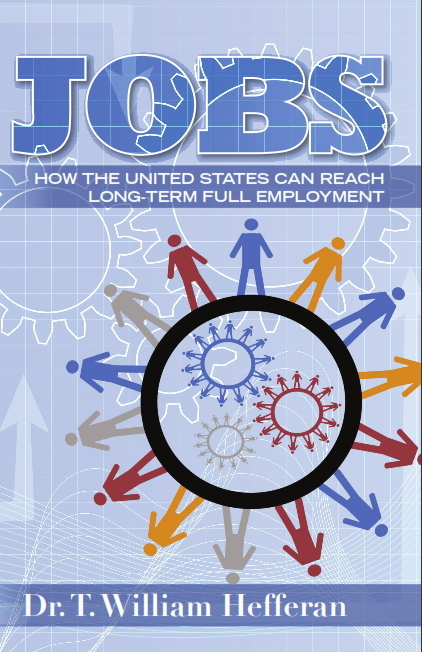 In JOBS, Dr. T. William Hefferan, DBA, MBA, CCIM, CPM provides a stunning approach to how we achieve long-term full employment in the United States. Learn how the essential shift in how we need to think about jobs and employment accelerates our timely transformation into a knowledge worker economy. This profound shift invigorates our heritage and foundation of innovation and entrepreneurship – restoring our global leadership in education and learning – leading to a dawn of new discoveries, creating exciting new jobs and unique careers. Learn how everyone benefits from this journey to a steady stream of rewarding jobs as Dr. Hefferan demystifies our journey to long-term full employment with his original entertaining presentation style. With over 23 years of experience as President/CEO of a 100 employee company, Dr. Hefferan decided to put his corporate work experience together with his academic background and solve one of our most significant societal problems. His unique approach to explore ways to end the persistent ups and downs of unemployment includes a peer reviewed research study he designed specifically to discover ways to solve the problem. Dr. Hefferan shares with readers his life-changing event that compelled him to dedicate over three years of his life to find these sound solutions, creating a blueprint for America to reach long-term full employment. In JOBS, the unemployed as well as employees wanting a better job learn how to secure their perfect job; employers learn how to attract and retain top-tier employees; and entrepreneurs feel personal growth as they discover new ways to put their ideas and initiatives to work. Learn the value of ethics and authenticity in the workplace and why everyone in an organization can be a leader — adding value to the company and the employee’s career growth. Join Dr. Hefferan in this contemporary revolution to a brand new America that will always have meaningful and rewarding jobs. In an exclusive interview on The Hutchinson Report Newsmaker Hour on KTYM 1460 AM Radio and heard nationally on six stations and in fifty cities and Washington D.C. nationally on the Hutchinson Newsmaker Network, on Friday, January 27, 9:30AM PST and Saturday, January 28, 7:00 PM PST, former Congressional Black Caucus Chair Congresswoman Barbara Lee takes a hard look at the pitfalls and prospects for President Obama’s reelection. Lee tells what the President must do to win over independents and fire up wavering Democrats. Will Gingrich Bring White Supremacy Back to the White House? Put “President” in front of Newt Gingrich and there’s an even chance “white supremacy” could be put in front of his presidential moniker. The suddenly surging Gingrich upped his racially loaded pandering scorecard with the resurface of a handwritten first draft of a series of talks he prepared in 1993 a couple of years before his ascendancy to House Speaker for his prescription for “renewing American civilization”. Gingrich initially scrawled that while Asians, and presumably whites, understood how to build businesses and acquire wealth, Latinos were sorely lacking in wealth and business acumen and blacks were even more hopelessly ignorant of what it took to succeed in the business world. Gingrich cited no figures, studies, or research to document his blatant falsehood. But he really didn’t need to for two reasons. By the time a member of Gingrich’s staff typed up the notes and prepared the speech for delivery at the National Review Institute, the racially inflammatory digs had been scrubbed out. By the time he delivered the talks they appeared to be racially neutered and came off as just Gingrich pontificating on the his stock tout of free enterprise, personal strength and values, American resolve, and America’s alleged technological superiority. The other reason Gingrich’s racial pandering passed under the public radar scope is that the GOP had long refined the art of racial code speak. So Gingrich simply entitled his talks “the five pillars of American civilization.” It was understood that talk of values, strength, enterprise, and technology punctuated with the caption “American civilization” was a not so subtle way of boasting of the alleged paramount role of whites in building American civilization and the alleged drain on building American civilization by Latinos, and especially blacks. 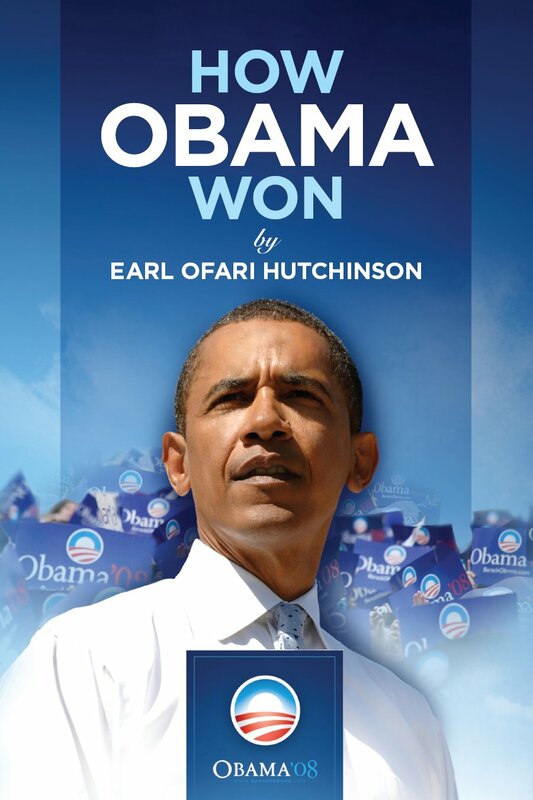 Throughout the week – we will be sharing insights from political analyst and author, Earl Ofari Hutchinson, from his latest book – How Obama Governed. Wednesday night is President Obama’s State of the Union address and we are bringing you unbiased information about topic that have an impact on the Obama administration at this time. Please join us as we share this information. Below is a summary about How Obama Governed and a schedule of blogs that are sharing these articles throughout the week. 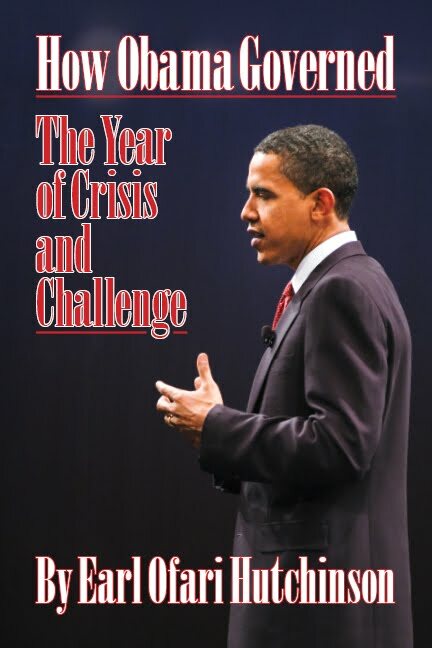 How Obama Governed: The Year of Crisis and Challenge. Author and political analyst Earl Ofari Hutchinson takes a no-political holds barred look at President Barack Obama’s first year in office. He answers one compelling question: Did he fulfill the massive and sweeping promise he made to restore hope and effect change in America? This promise energized millions, reshaped the nation’s political tapestry, and propelled the first African-American into the White House. 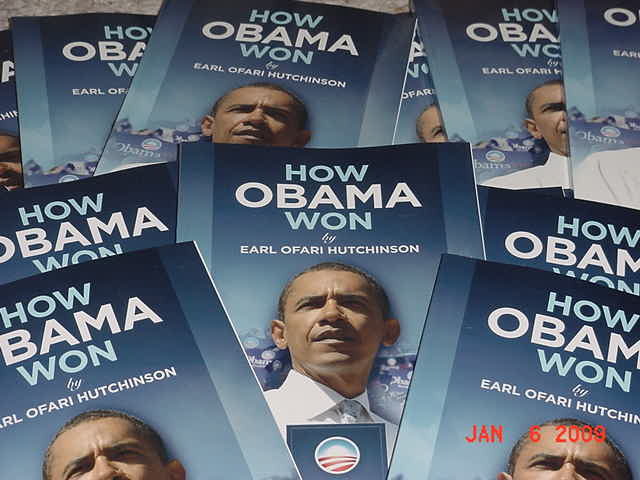 Hutchinson examines where and how Obama kept his promise, and where and how he failed to keep it. He examines in laser detail the attacks and counterattacks from the GOP and the Democrats. He delineates the differences and similarities between Obama and Bush in waging the war on terrorism. He assesses the towering battles over health care, the economy, racial attacks, the GOP counterinsurgency, Afghanistan, and the Henry Louis Gates flap. He provides readers with a guide as to how Obama will continue to govern. He examines the attacks and counterattacks from the GOP and the Democrats on Obama. He delineates the differences and similarities between Obama and Bush in waging the war on terrorism. He assesses the towering battles over health care, the economy, racial attacks, the GOP counterinsurgency, Afghanistan, and the Henry Louis Gates flap. He provides readers with a guide as to how Obama will continue to govern. How Obama Governed: The Year of Crisis and Challenge offers a virtual political clinic on the crisis and challenges that the nation and its first African-American president faced his first year in the White House. To book Earl Ofari Hutchinson for an interview and/or commentary on the promise and pitfalls of Obama’s first year in office. Call 1-323-383-6145 to schedule. Earl Ofari Hutchinson is a nationally acclaimed author and political analyst. Hutchinson is the author of ten books on race and politics in America. NPR.org, January 19, 2009 · Throughout Inauguration Day, the NPR news team and a few political journalists will take your questions and chat about the inauguration of Barack Obama. Nina Totenberg kicks off our chats at 10 a.m. ET. A schedule follows, but it can and probably will change, so check back often.